← Wind Turbines: Friend or foe? The 550m March to your MPP’s Office! Join the Protest! Spread the Word! These can cause sleep disturbance, chronic stress, depression, migraines, nausea, memory loss, dizziness, vertigo, burning sensations, and have adverse effects on farm animals such as breeding cattle. Impact on birds and bats, destruction of natural and social environments, visual impact, loss of farmland. Density and proximity of IWTs to our homes, farms and communities can result in a drastic loss in your home’s market value. Big $$$ paid to wind companies + new transmission: up, up, up! Lambton-Kent-Middlesex- Over 500 Wind Turbines proposed/built in this riding. Thamesville, Alvinston, Petrolia, Ravenswood, Arkona, Adelaide and anywhere in between. Ms. Van Bommel has agreed to meet us at her office and speak to the crowd at 12:00 noon. Bring signs (homemade ones are great), kids, pets, noisemakers/instruments, costumes. 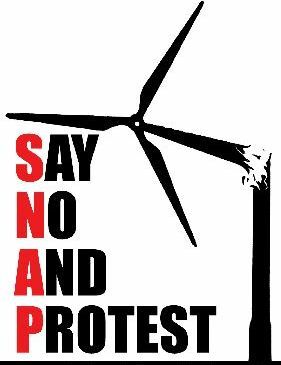 Print Protest flyer and hand out to those who oppose wind turbines! Posted on March 13, 2011, in Health, Take Action. Bookmark the permalink. Leave a comment.